What is AIG or Asian Indoor Games? AIG is an indoor sporting event held every two years exclusively for Asian countries. The sports contested are mostly the kinds that have yet joined or included in continental or world sport events. Chess will be one of the sport disciplines contested. How many Asian countries participated? 45 Asian countries including Malaysia. Where the event will be held and when? For the third AIG, it will take place in Hanoi, Vietnam from 30th October until 8 November 2009. Will Malaysia participate in the chess event? GiLoCatur is not sure and still looking and "googling" for the answer. When is the playing schedule for Chess? According to 3rd AIG official website, chess will be played from 31st October to 7th November. If Malaysia participate, who will play for our country? Also GiLoCatur still do not have the answer. During this weekend, IM Mas and FM Mok will play in the Malaysian Masters semi finals. It seems that they are not going to Hanoi. But who will represent Philippine in chess, GiLoCatur can give the answer. It has been published in Susan Polgar's blog. RP will be represented by GM Mark Paragua and GM Rogelio "Joey" Antonio, Jr for men's and WFM Catherine Perena and Sherily Cua for women's. For further details and facts about the 3rd AIG, please visit this link and 3rd AIG official website. * Tempat adalah terhad dan tertakluk kepada penyertaan terawal (first come first serve) yang diterima. 1) Kejohanan ini tertakluk kepada undang-undang FIDE. 2) Setiap kawalan masa untuk satu permainan ialah 25 minit. Setiap perubahan pada kawalan masa akan ditentukan oleh Arbiter mengikut jumlah peserta. 3) Setiap pemenang hanya tertakluk kepada satu hadiah sahaja. 4) Sebarang keputusan adalah muktamad. GiLoCatur tertarik membaca artikel di bawah sewaktu browsing di laman blog Susan Polgar. WINDHOEK - Bank Windhoek handed over 550 chess sets to the Namibian Chess Federation (NCF). The equipment will be handed over to the Namibian Schools Sport Union (NSSU) whereupon it would be distributed amongst 100 needy schools in the south. “Chess has proven to improve the cognitive skills of children. Therefore, Bank Windhoek is proud to support this undertaking as the sets given to the NCF will facilitate improvements in the memory, concentration and time management skills of over 1000 children in many schools in the south,” said Bank Windhoek’s head of Corporate Communication and Social Investment, Riaan van Rooyen. “Chess for Namibia means a smarter Namibian nation,” added the president of the Namibia Chess Federation Max Nitzborn, who further elaborated that the NCF is trying to implement chess as a subject in schools. “It has been proven without doubt that playing chess enhances the academic performance of children,” said Nitzborn. The NCF has undertaken to develop children’s skills in chess by sending grand masters from the NCF to travel around the country teaching and identifying raw talent that can be trained and mentored into grand masters, to represent Namibia internationally. Recently, chess players from various schools across the country competed in South Africa and won a bronze medal. With the support of Bank Windhoek, the NCF in 2008 distributed 1000 chess sets to schools in the northern region and more than 2000 children benefited from this venture. Ada beberapa point atau soalan yang GiLoCatur nak highlight demi kemajuan catur di negara ini. Tidak adakah bank di negara ini yang ingin menyumbang chess set ke sekolah-sekolah atau kelab-kelab komuniti di negara ini terutamanya di luar bandar memandangkan chess atau catur mempunyai banyak kebaikan terutamanya kepada generasi muda negara? Tidak adakah bank-bank di negara ini yang ingin memberi sumbangan dana atau sponsor kepada pemain-pemain catur muda yang berminat, berbakat dan bercita-cita ke peringkat paling tertinggi iaitu Grand Master dan kejohanan peringkat antarabangsa? Jika di negara-negara luar tidak kira negara maju atau sedang membangun seperti Namibia ada usaha dan kesungguhan untuk menjadikan chess sebagai salah satu subjek di sekolah, bagaimana pula di Malaysia? Jangan terkejut jika satu hari nanti Namibia yang pada ketika ini hanya ada seorang FM dan 2 orang candidate master (seperti di bawah), akan mendahului Malaysia mempunyai Grand Master di atas usaha-usaha yang mereka lakukan untuk maju dalam catur / chess. Apakah yang bisa (meminjam Bahasa Indonesia) pemain-pemain catur muda negara dan ibubapa mereka lakukan untuk dapatkan "chess development program"? How the performance and what are the results of GiLoCatur's children in the recent UPSI Chess Open? 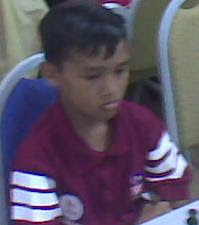 Fikri, the eldest son, managed to win the fifth place after 5 wins, 1 draw and 1 loss (5+1=1-). Below is his full rounds results. 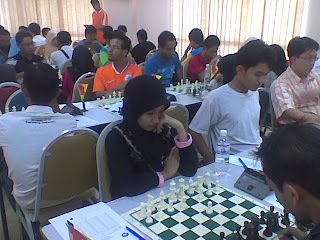 Anis Fariha, the only daughter, was place the 33th position after 3 wins, 1 draw and 3 losses (3+1=3-). Below is her full rounds results. This year edition is a very strong and competitive tournament for Primary School category. Several MSS players were participating. Even three U12 MSS players played in the Open category. Fahim Al-Faqeh, the youngest child, was placed the 44th position after 3 wins and 4 losses (3+0=4-). Below is his full rounds results. Fahim still has lots to learn in chess and needs more experience and tournament exposure. He is just 7 years old and just participated in less than 10 chess tournaments. Furthermore, he plays too fast. Most of his rounds completed in less than 15 minutes. Hopefully, he will pick up the skills and experience by participating in more and more chess tournaments. He is a bit lucky because starts early in chess compared to his elder brother who started when he was 11 years old and his elder sister who started when she was 10 years old. Firey_Rook papparazied GiLoCatur and had taken the above picture. 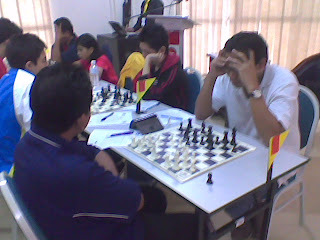 The young and energetic man standing beside GiLoCatur is non other than Sharil Izam Bin Muara, the president of 2009/2010 UPSI Chess Club. Syabas and tahniah to him and his hardworking crew members for the successful 3rd UPSI Chess Open. More UPSI Chess Open pictures can be viewed here from the camera of Mr Firey_Rook. 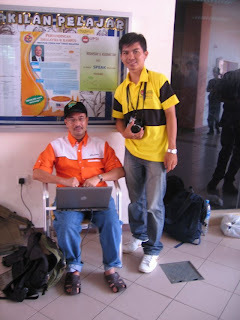 GiLoCatur with new shirt blogging at UPSI Tanjung Malim. Since GiLoCatur did not participate in the tournament, beside monitoring the children GiLoCatur was blogging about the chess tournament. The internet connection was very very poor in the afternoon. Hence, GiLoCatur could not update and blog about the tournament. 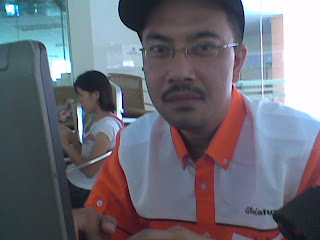 Cikgu Zullkafli, one of the three arbiters. The beauty of chess is that it does not bother about age. 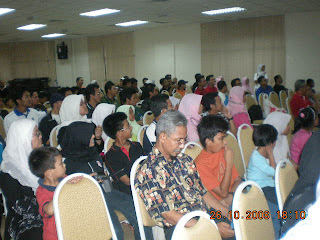 In the above picture, 10-year old WFM Nur Najiha was competing againts 40+ Kamaluddin Yusuf. It was in the fifth round. GiLoCatur had a couple of games with Shamsudin Sabri aka Firey_Rook during his round break. The last game was stopped as the above position since the next round was going to start. Whose position is winning? What white should move next? GiLoCatur is hoping that the nearby schools which were participating should organize chess tournaments and workshops at their schools. 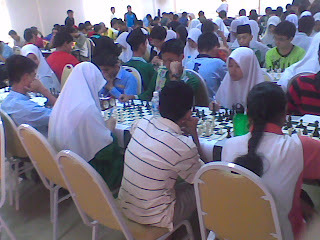 Or maybe UPSI Chess Club can conduct chess friendlies or chess tournaments with these schools. Surely by having regular chess tournaments and activities, many more chess talents will emerge from the district. GiLoCatur is not sure from which school the above Indian / Singh boys are from. Based on the players pairing list, GiLoCatur believes they are Singh brothers - Rajdev and Jagedr. 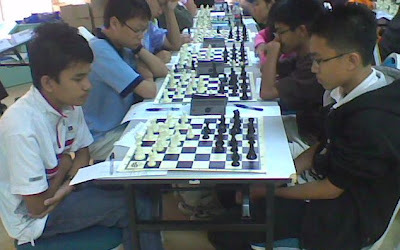 Beside them, Alvin Dass a/l Arokianathan and Suganyaanair were also playing in the Secondary School category. If they or anyone knows about them read this blog entry, please provide GiLoCatur more info. 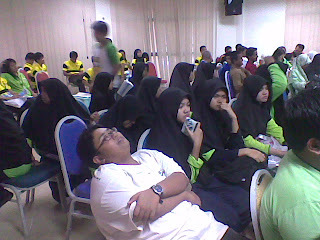 Seen Zefflyyudin Alminsyah taking a rest while waiting the closing and prize giving ceremony to start. 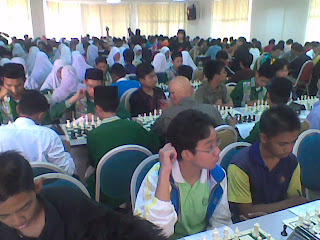 One of Penang contigent members, he made new friends with other chess players like with the SMKA Slim River girls (wearing green shirts and black tudungs). GiLoCatur and family just got home from Tanjung Malim a couple hours ago. After the prize giving ceremony which ended at about 7.45 pm, we had dinner at a restaurant. Then, we drove off home after two days at UPSI and Tanjung Malim. GiLoCatur does not have the complete final standings as had to have Maghrib prayer during the ceremony. But below are the champions for each of the main three categories. The champion is the 2nd edition winner, Ian Udani, 6 1/2 out of 7 points. The champion is Muhd Syakir Shazmeer Azhar MS, 6 1/2 out of 7 points. 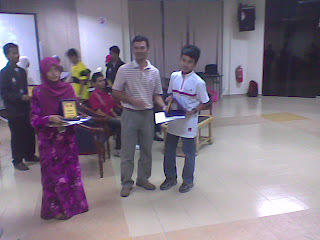 The champion is Muhd Irfan Haqqim Azhar MS, 6 1/2 out of 7 points. 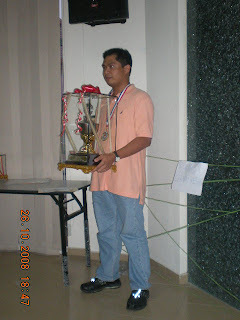 GiLoCatur was very surprised when called upon by the emcee to receive a token of appreciation from the organizer for promoting and publishing the tournament in this blog. Thank you very much to the organizer for such appreciation. Actually, GiLoCatur and other local chess bloggers just want to promote chess events and tournaments. The small contribution is in fact because GiLoCatur is crazy and passionate about chess and to support the children on chess. Syabas and tahniah to the tournament organizer and all the crew involved in making it happen. 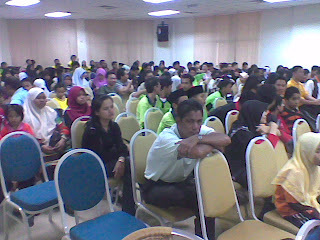 It is a very good turn out. The total number of players participated is 267 more than the 200 target. 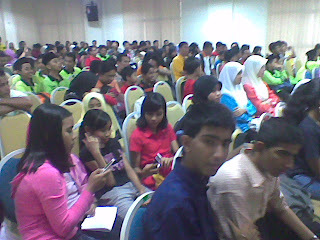 The organizer managed to get several schools nearby to participate like SK Slim River, SK Tanjung Malim (website), SK Ulu Bernam (website) and SMKA Slim River (website). Syabas and tahniah also to all the teachers from such schools as well as several parents who sacrifice their weekend to accompany their pupils to the tournament. GiLoCatur would like to praise the organizer for allocating quite a sum of prize money especially for the school categories. 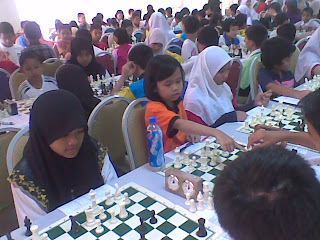 It is very essential as to motivate Malaysian school children to be involved in chess. Round 4 is in progress. It started sharp at 8.30am. Below is the leaders for each categories. The players on the top six boards had won all their three previous rounds. The defending champion and the top seed, Ian Udani, is challenged by Ahmad Fadzil Nayan of UIA on the 1st board. Can Fadzil, a Perakian, who plays white win to stop Ian on his mission to be the champion? Ian Udani is unstoppable. He defeated Fadzil Nayan. Another Perakian, Mark Siew plays black on the 2nd board againts the National Master Evan Timothy Capel of Penang. (Mark Siew managed to win this game). WCM Nur Nabila AH who will represent Malaysia in the APSSO meet in Jakarta and World Youth in Turkey is competing againts the fourth seed, Abdullah Che Hassan on the 3rd board. The 12-year-old Nabila won the game. On the fourth board, Sahir Sarifdin of 17ChessClub, will challenge NM Kamal Arifin Wahiduddin. Surely, all Sahir's 17ChessClub buddies are hoping and praying that he will cruise all the way to achieve the best results in this UPSI Chess Open. (Unfortunately, Sahir could not manage to win againts the experienced NM Kamal Arifin). UPSI Chess Club president, Zarul Shafiq the son of Cikgu Zull and Cikgu Sofi is being challenged by the 13th seed on the fifth, Wan Mohd Fazli Wan Nawawi. The last perfect scorer pair is between Ibrahim Ahmad and Muhd Nabil AH, the elder brother of WCM Nabila. They are playing on the 6th board. Both Zarul Shafiq and Muhd Nabil cruised to the next round after winning their respective games. 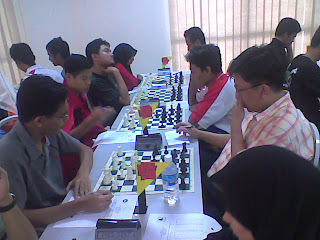 Fikri (left on white shirt) versus Syakir Shazmeer, the leader of the pack. Eleven players, mostly the top seeds, in this category have won all their three rounds so far. Six players, the top three boards, in this category have full three points so far while other six players including the top two seeds have 2 and 1/2 points. Three dedicated chess moms who are also teachers. 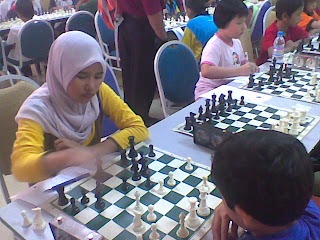 Their children were and are MSS Selangor chess players. 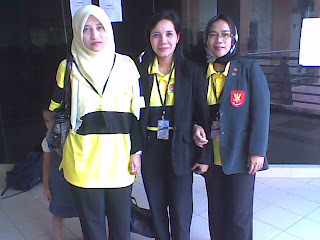 One of them, Cikgu Sofi is the mother of a National Master (NM) and National Woman Master (NWM) while Cikgu Zaza is the mother of a WFM (Woman Fide Master) and WCM (Woman Candidate Master). GiLoCatur hopes many more Malaysian mothers and teachers follow their suit and journey in developing and teaching their children CHESS. 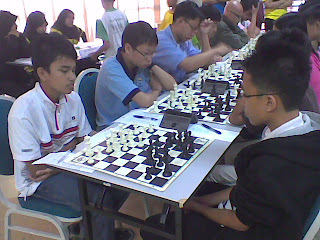 GiLoCatur also got a chance to have a 10-minute chit chat with Mr Teh of Penang, a dedicated chess parent too. Thank you to him for visiting this blog and his generous advise. As of 2.00 pm before the second round starts at 2.30 pm, most seeded players in all the three categories won their respective games. After Round 2, 24 players in the Open category scored the perfect 2 wins. Below is the third round pairing for the top 10 boards. 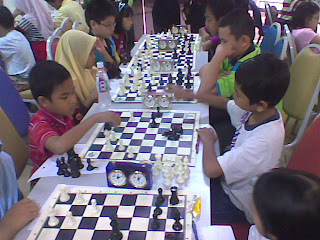 After Round 2, 23 players in the "Sekolah Menengah" category scored the perfect 2 wins. Below is the third round pairing and results for the top 10 boards. Tomorrow morning in the fourth round, Fikri will play black againts the top seed Mohd Syakir Shazmeer while his buddy, Muhd Faris, will also play black on the second board meeting the second seed, Keok Kai En. 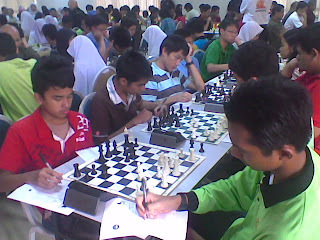 After Round 2, 17 players in the "Sekolah Rendah" category scored the perfect 2 wins. 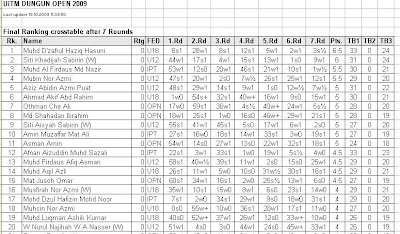 Below is the third round pairing and results for the top 9 boards. 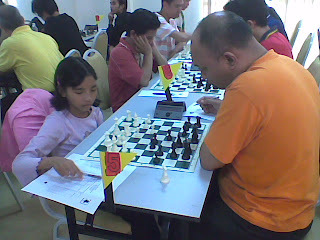 GiLoCatur and family drove off to Tanjung Malim at about 10 minutes before 8.00 am to participate in UPSI Chess Open. Eventhough, GiLoCatur had pre-registered in the Open category he did not play. Fikri, the eldest son played in the "Sekolah Menengah" or Secondary School category along with Faris, the eldest son of Aminuddin and Cikgu Shima couple. 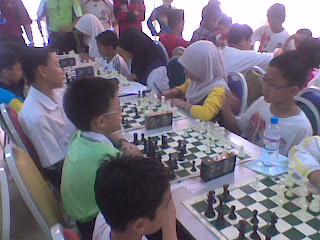 While both Anis Fariha, 11 years old, and Fahim Al-Faqeh, 7 years old, played in the "Sekolah Rendah" or Primary School. We reached the venue after 45-minute drive. After settling the registration, we went to a nearby mamak restaurant for a breakfast. Both GiLoCatur's sons had rice and fried chicken while GiLoCatur just had "Tosei Telur". Back to the tournament venue after the breakfast, the organizer was still busy with the registration. The arbiters were busy keying in the players' names. Due to a very good turn out and last minute registrations, the first round pairing could not be ready on time as per scheduled. Finally, the tournament began at 11.30 am. There are three categories - Open, Secondary School and Primary School. Leading the Open category is the defending champion, Ian Udani. 102 players participated in the category. There are 51 pairs. In Secondary School category, 91 players are participating. Most are from the schools nearby. Fikri , GiLoCatur's son, whose latest national rating is 1417 is seeded 6th. In the Primary School category, 72 players are participating. Besides players from Perak, the others are from either Selangor or Pulau Pinang. Several MSS state players are among the top seeds. 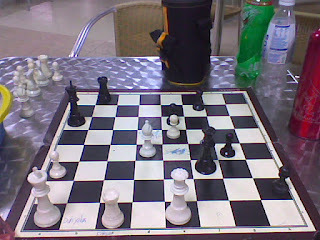 One of GiLoCatur's chess friends, Zali aka Ng6 (above picture), had started his personal blog. At this moment Ng6 is quite busy in making preparation to move to his new house. Hence he can't join chess tournaments. Furthermore, he just moved to new office which is nearer to home. Good Luck to Ng6 both at new office and at new house. His blog can be accessed at http://ng6-17chessclub.blogspot.com/. 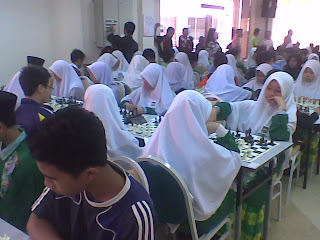 UPSI Chess Open - FLASHBACK! 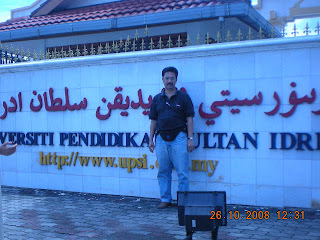 Insya Allah, this weekend GiLoCatur and family will drive to Tanjung Malim in where UPSI, a teacher university is located. 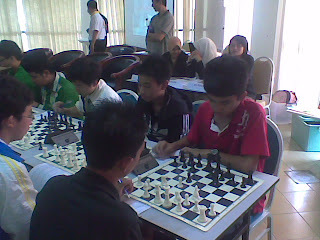 During this weekend, UPSI Chess Club would be organizing its third chess open tournament. The format would be G/60 (60 minute time control) 7-round Swiss System during two days - Saturday and Sunday. 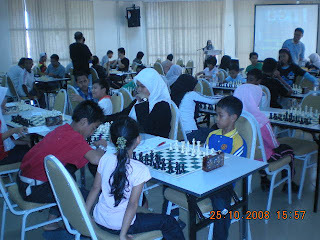 Last year, GiLoCatur with Fikri, eldest son, and Anis Fariha, the only daughter, also participated in the UPSI chess open held on 25th and 26th October 2008. 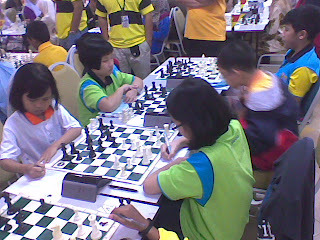 Both GiLoCatur's children were playing in the Under 12 school category while GiLoCatur was playing in the Open section. But this year, GiLoCatur most probably will not participate because want to focus on the children and doing coverage for the event. Fikri will enter the secondary school (U18) category while his younger sister, Anis Fariha, will play in the primary (U12) school category. Their youngest brother, Fahim Al-Faqeh (7 years old), may join Anis. 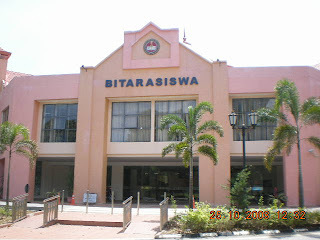 UPSI's BITARASISWA, the venue of the tournament. 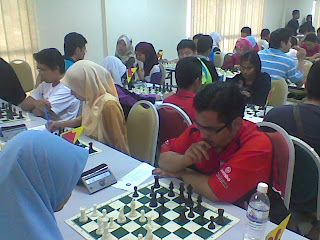 Some of the chess players participated in the 2nd UPSI Chess Open last year. Would Ian Udani defend his title this year? GiLoCatur is pretty sure Ian would defend it. But GiLoCatur believes his contenders and opponents would be much tougher this year. The prize money is the same as last year, RM 1,000. Would IM Mas play? FM Mok? FM Nicholas Chan? Let's see! Players and Parents during the closing and prize-giving ceremony. 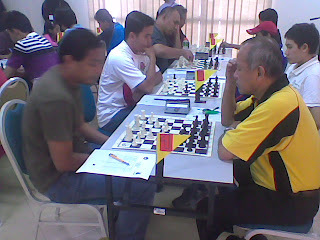 SYEDCHESS (redshirt) of http://syedchess.blogspot.com/, also came down all the way from Kedah and participated in the tournament last year. How about this year? Would he come down and play? 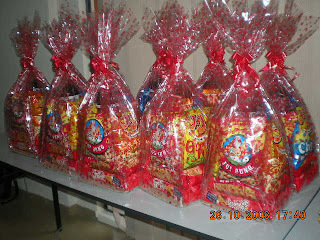 Hampers for lucky draw. This year there would be 10 lucky draws. 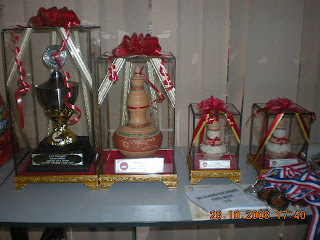 The entries of last year's UPSI Chess Open. So, see you all at UPSI Chess Open this weekend folks! 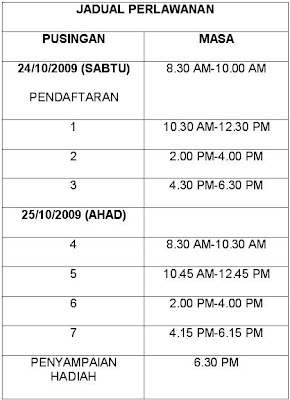 The registration deadline (closing date) >>> 20/10/2009 <<<. The total money prize >>> RM 6,000 <<<. 10 CABUTAN BERTUAH UNTUK DIMENANGI!! Tournament entry fees must be paid on registration days. 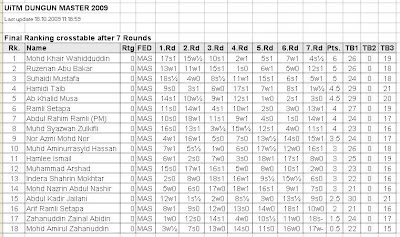 Muhd Nabil Azman has dashed 2008 MSSM U18 Individual champion, Lim Zhou Ren, hope to win the Deepavali Rapid Chess. Nabil, the U15 Selangor state player, scored 8 and 1/2 points out of 10 rounds. He was ahead of the the first runner up by half point. In the third place is Muhd Syakir Shazmeer, Nabil's U15 teammate, with 7 and 1/2 points. Stonemaster and Jax Tham, both tied with 7 points, are fourth and fifth placings respectively. Congratulation! to all the winners. 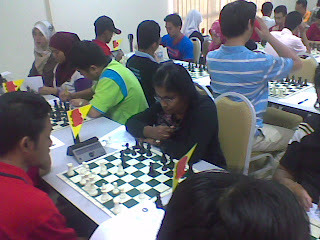 More stories and pictures of Deepavali Rapid Chess can be viewed at http://fireyrook.blogspot.com/. 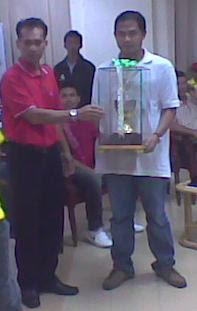 In the Masters category, Mohd Khair won 5 games and drew the other 2 to win the UiTM Dungun Open. He is ahead by one point to the first and second runner up, Ruzenan Abu Bakar and Suhaidi Mustafa, respectively. Below is the final cross table. Below is the final crosstable for the Open category. It is encouraging to see that three Under 12 players are among the top 5. Muhd D'zafrul Haziq, a high schooler won his first six rounds and drew the last one to be on the top of the table.Terengganu state U12 player, Siti Khadijah Sabirin, showed her prowess by being second. Her only defeat was to the leader in the sixth round. Below is the top 20 final crosstable. Tahniah! to all the winners. 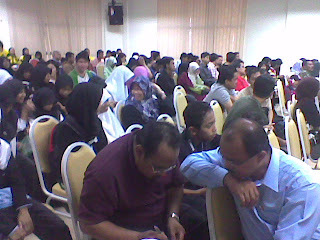 the 2nd IIUM Chess Open POSTPONED!